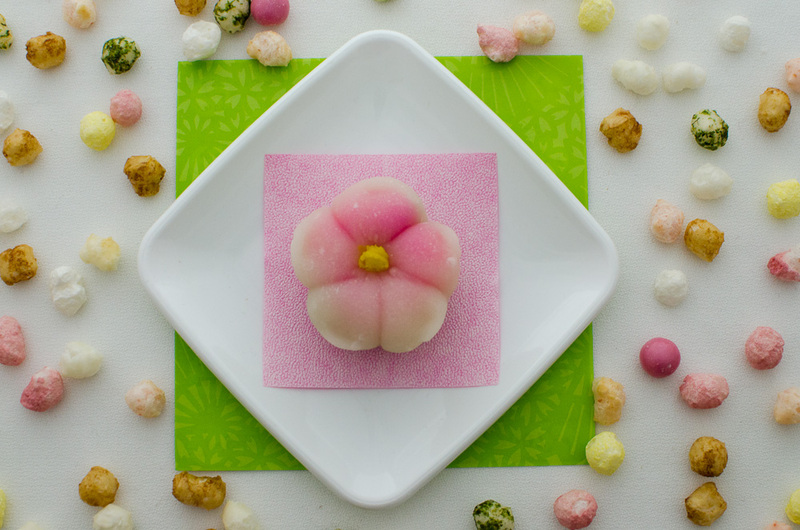 It’s raining rice crackers on Sakura mochi! 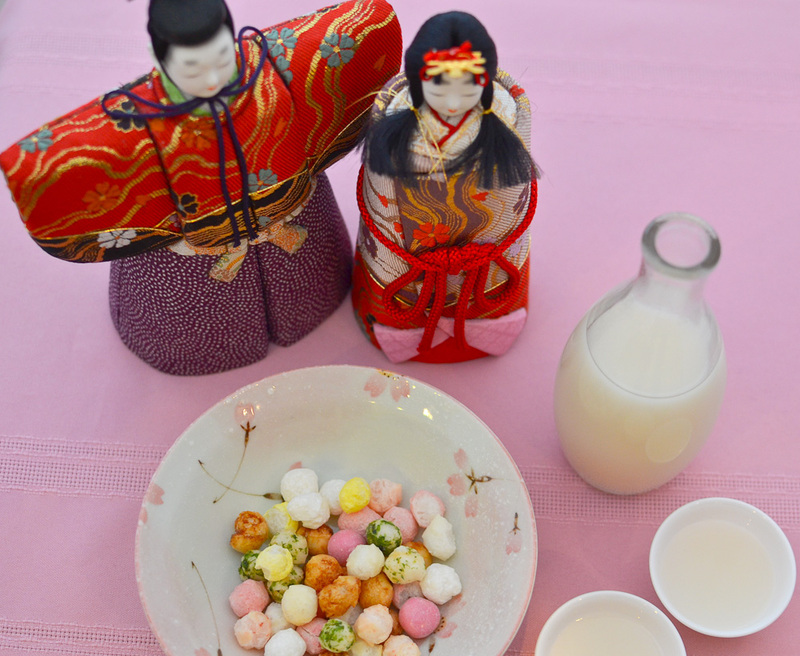 Last Saturday, March 3rd, we celebrated Japanese Girls’ Day, also known as Hinamatsuri (Japanese Doll Festival). A couple of days before Girls’ Day, I was lucky to be able to watch some special Girls’ Day mochi being made at Osaka-Ya, the only Japanese confectionery shop in the area. You may have read about the great mochi fundraiser I organized last month with Osaka-Ya mochi and manju. 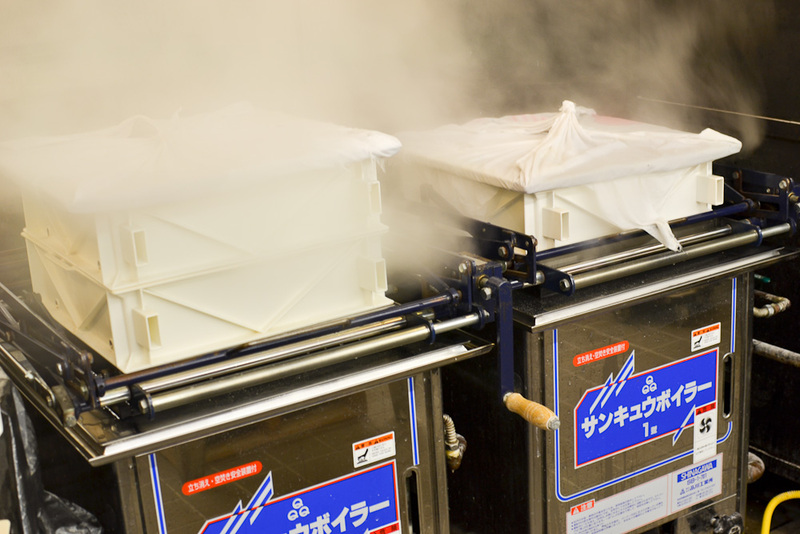 Early in the morning, racks of mochi and manju start steaming. 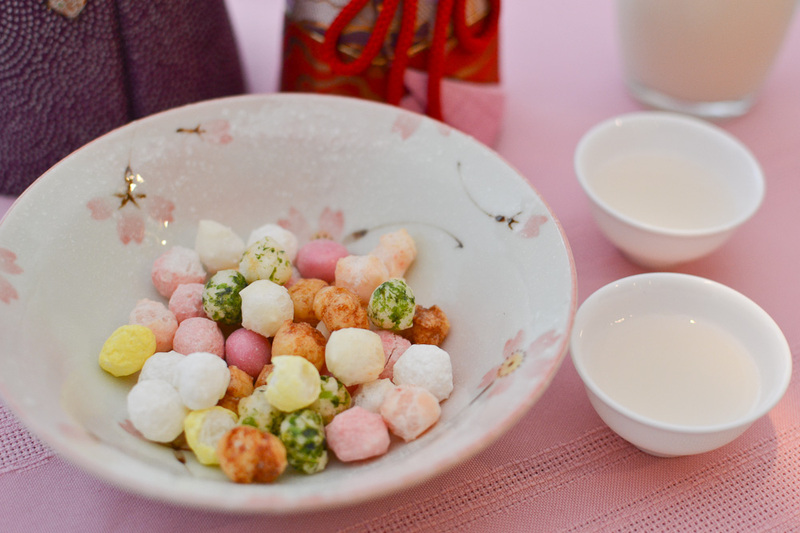 In addition to the regular menu, special confections are typically made for Girls’ Day (March 3), Boys’ Day (May 5), and New Year’s Day (January 1), starting from the week before each event, through the week after. 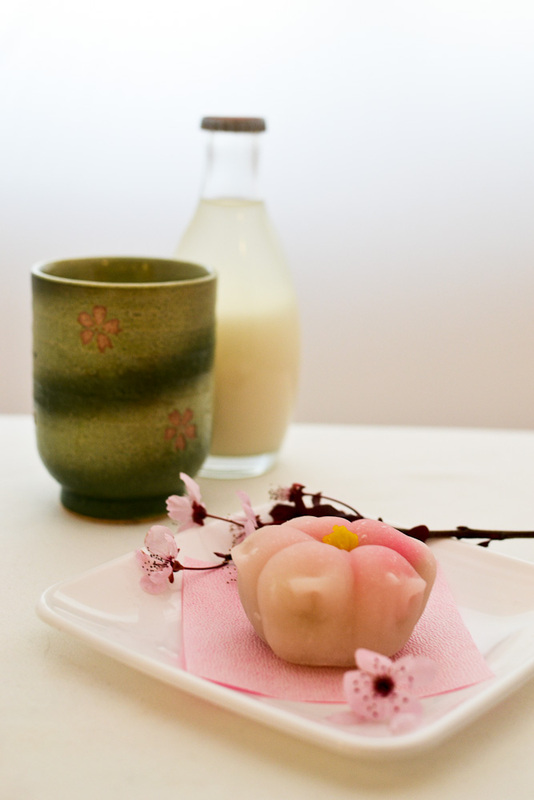 The three special mochi made in honor of Girls’ Day were Sakura Shaped Mochi, Domiyogi, and Dango. Beans for the fillings are first cooked in a giant kettle, then they are put through this special deskinning machine. This takes a few hours. 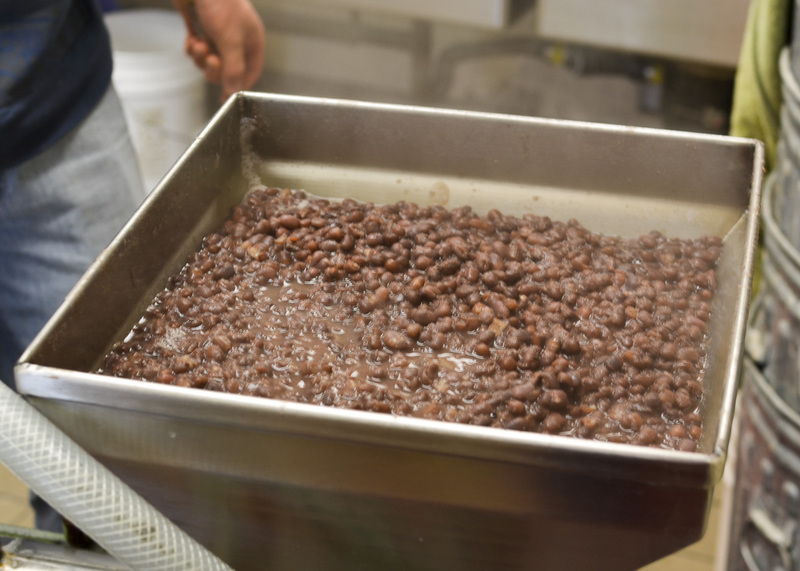 The deskinned, cooked beans are then returned to the kettle and cooked with sugar. 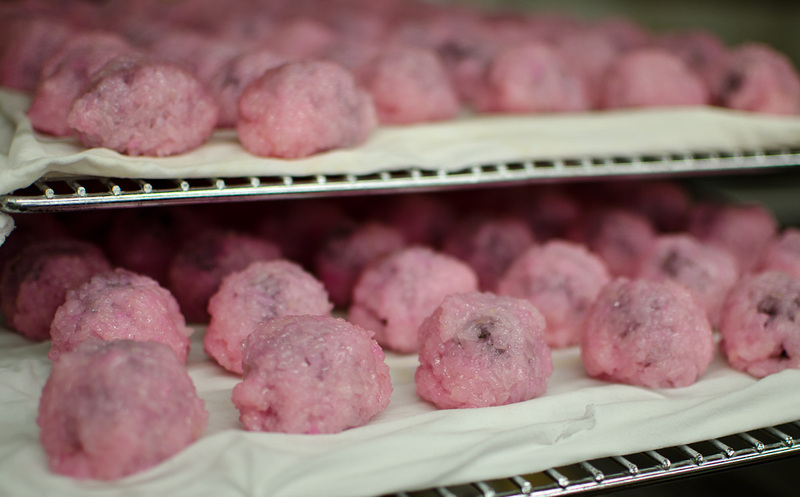 This hours long process is done for smooth red bean filling (pictured), and smooth white bean (lima) filling. The sakura blossom (cherry blossom) is one of the classic symbols often used to depict Japanese culture. 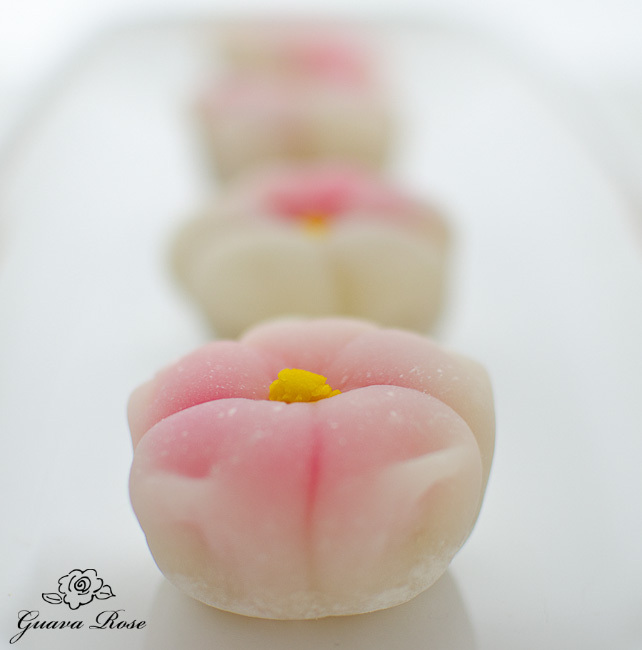 Here we have the white mochi, pink mochi, and pieces of smooth white bean filling (far right) to form the base of the sakura flower. 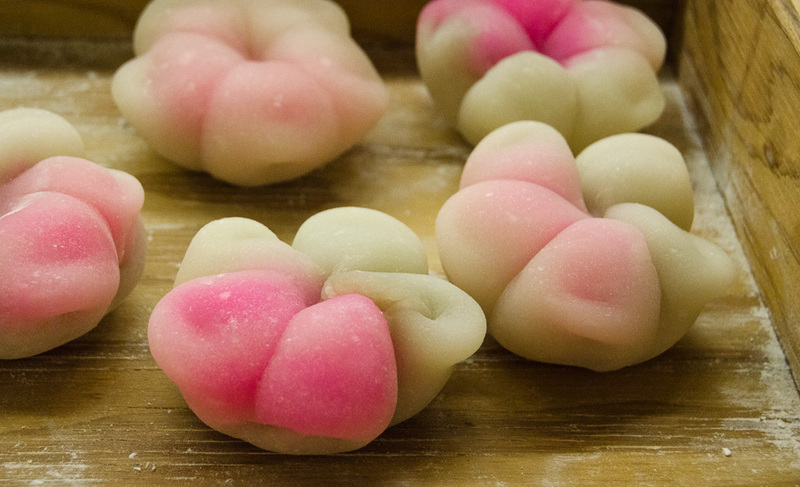 Pieces of white mochi are flattened and filled first with a knob of bright pink mochi, then a piece of white bean filling. All hands work lightening fast, sealing them up into little balls. The brush kept moving so quickly here that it took several shots before I could actually catch a shot of the brush! How beautifully translucent they look. 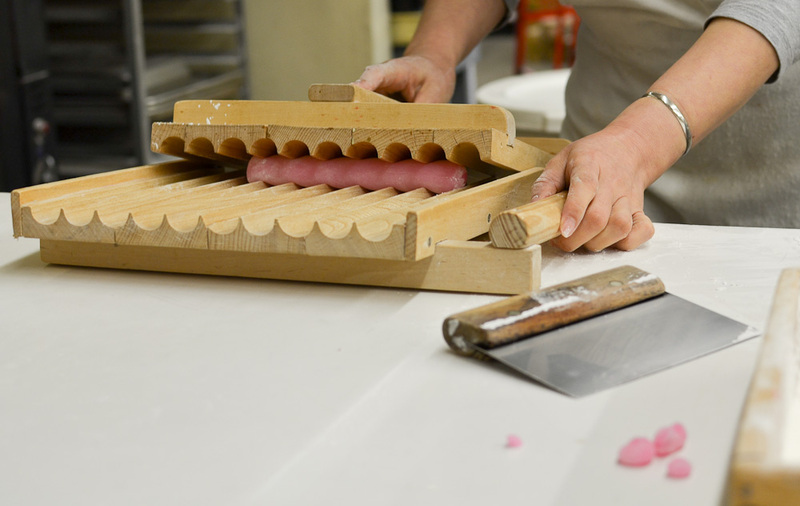 Here’s the beginning of the sakura shaping– all meticulously done by hand, with specially carved wooden sticks. Again, the movements and motions, were incredibly fast. 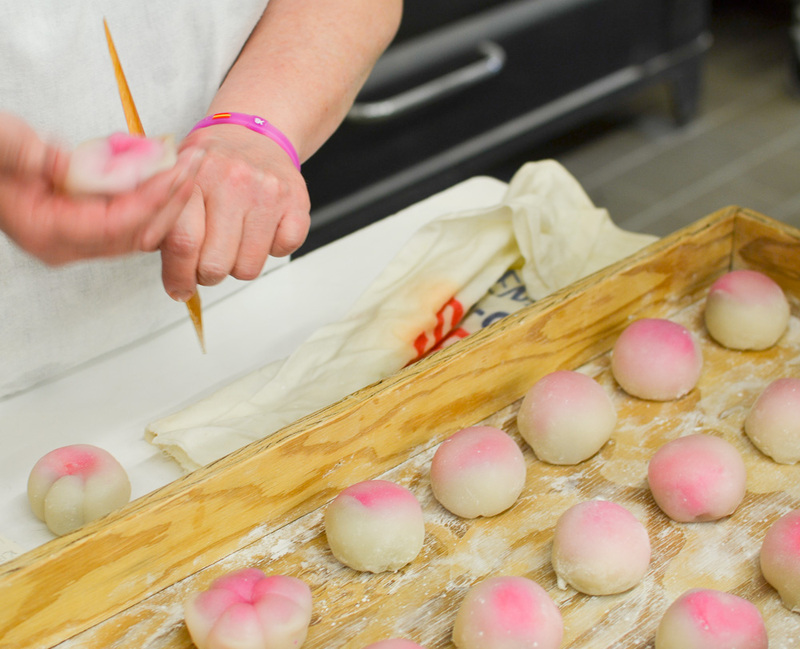 Owner Linda Nakatani first started helping her parents in the shop when she was 6 years old, and was making mochi and manju by the time she was 12 years old. During these special holiday weeks, Linda easily works 12 to 14 hour days to meet the demand. 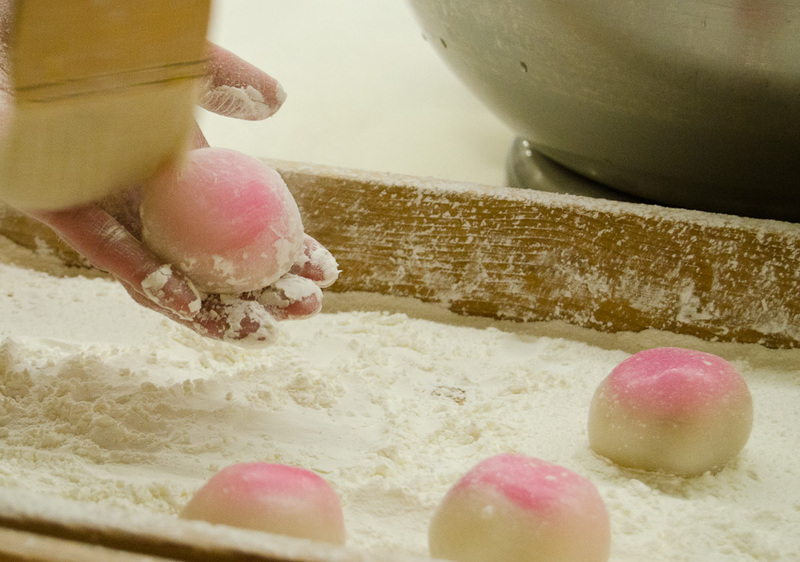 In many families, it’s the third generation continuing to come in and pick up mochi and manju for these special occasions, as well as year round. Originally Linda’s parents, Asako and Kenji Nakatani, took over this business in 1963. They eventually changed all the recipes over the years, making their own. Now Linda is assisted by a part time staff of family and friends. On the day I was there, two moms, and each with their own college aged sons were all working. It was entertaining to see the comraderie and fun teasing going on between them all. From what I gathered of the banter going on there that day, all that mochi stirring and pounding is apparently a really good workout. 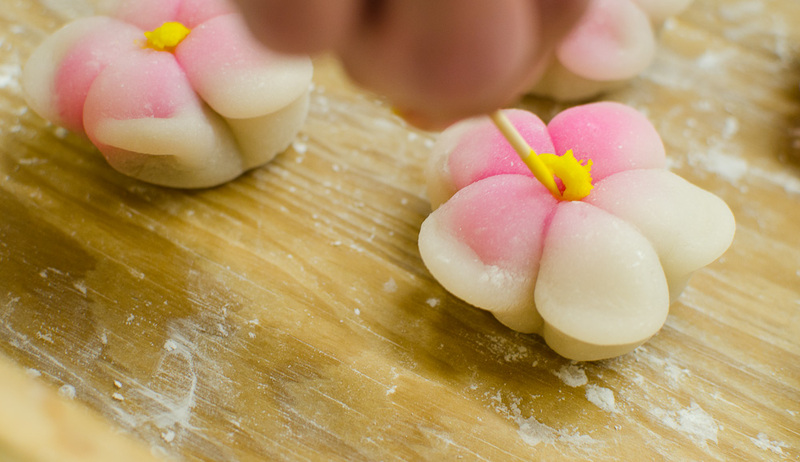 The final touches– yellow mochi bits for the middle of the sakura blossoms. Truly a labor of love, but a beauty to behold. I really cringed the couple of times a finished piece of mochi fell to the ground and had to be thrown away– sooo much effort and care goes into making each piece. 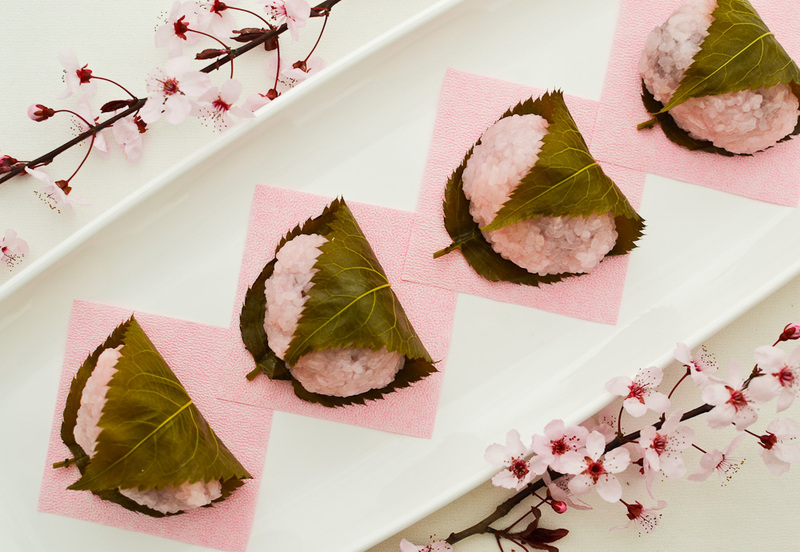 Domiyogi is steamed mochi rice with a smooth red bean filling, wrapped in a sakura leaf. 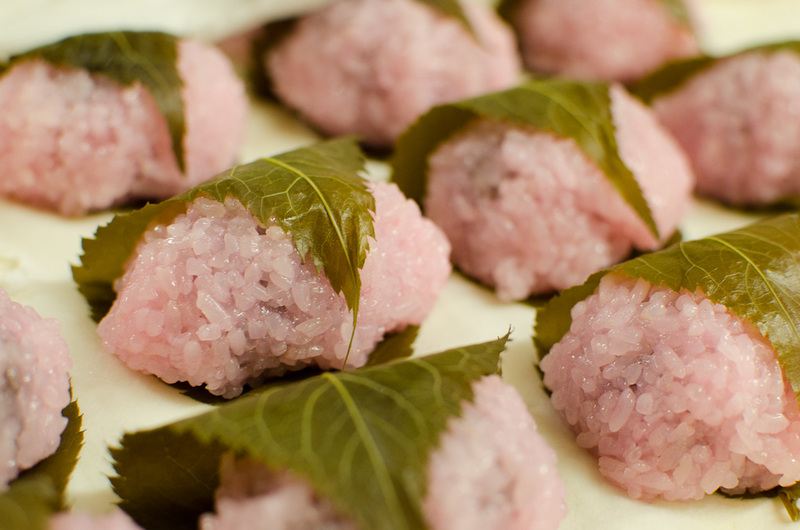 The sakura leaves are marinated in a brine, and are quite similar to marinated grape leaves. 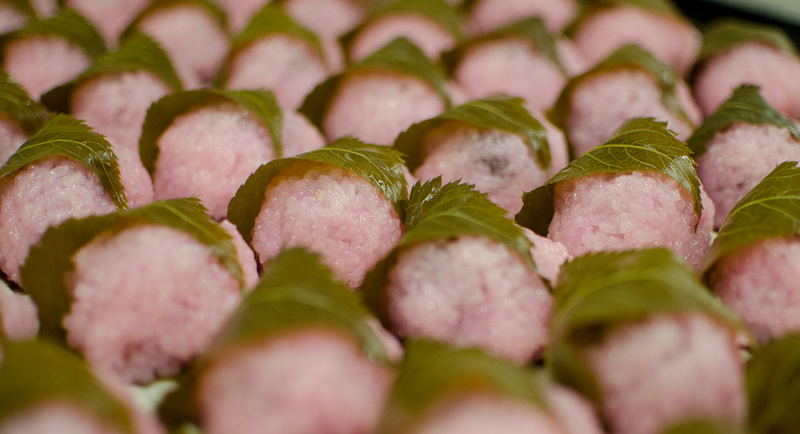 First the mochi rice is cooked, colored, and wrapped around the sweet bean filling. 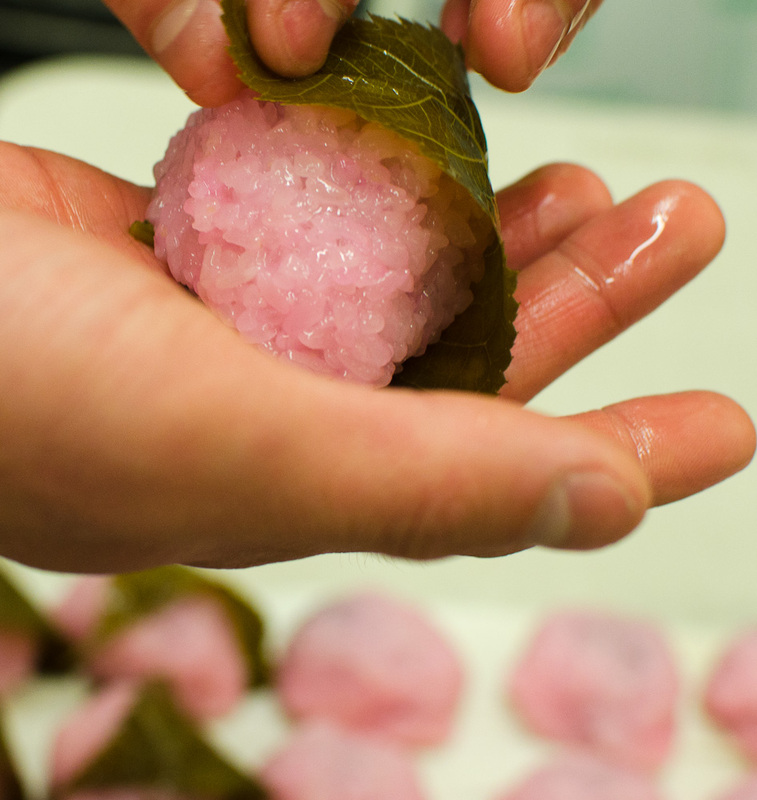 Then each piece is carefully wrapped in a sakura leaf. 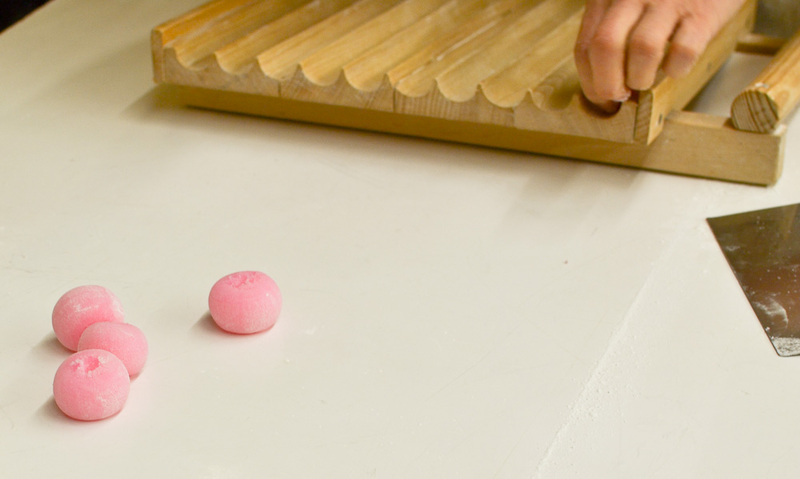 Some people remove the leaf before eating the mochi. 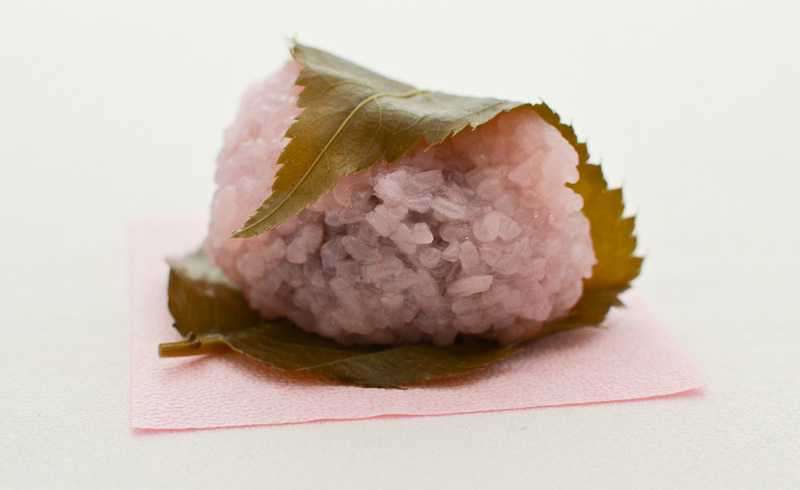 Others like the slight saltiness of the leaf paired with the sweetness of the mochi. It’s a Domiyogi nation! I like the one leaning back relaxing. See it? Relaxing is something I did not see on this day. Everyone was on their feet working the entire 6 hours I was there– and they were all there before I got there, and after I left. Whew, this is exhausting work! 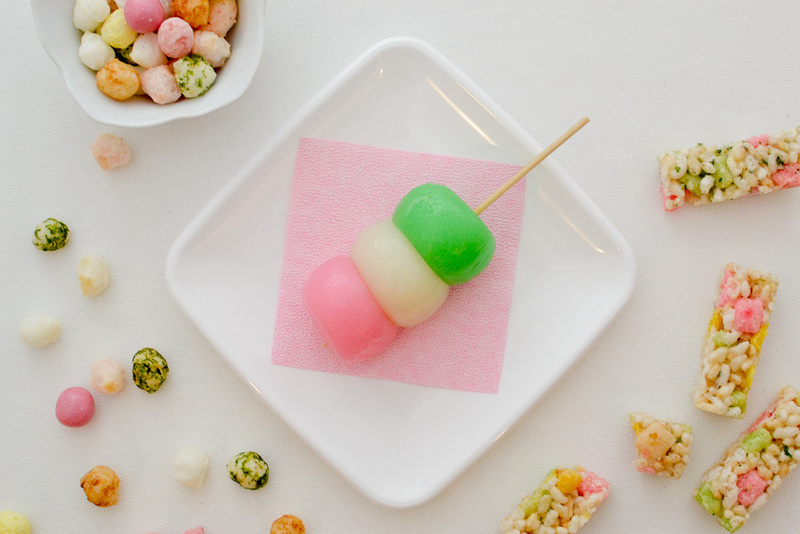 Pink, white and green Dango. 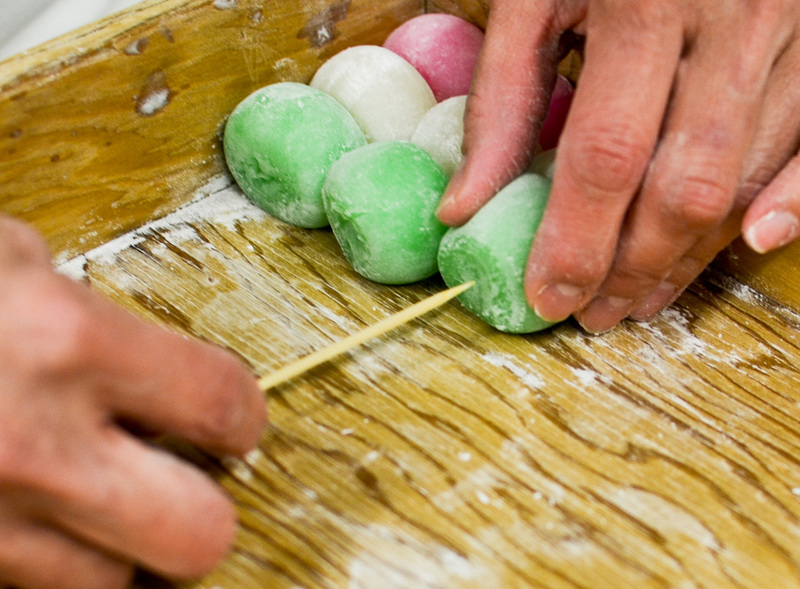 Sweet mochi balls on a stick. The pink symbolizes the sakura flower, the white represents snow, and the green represents branches and growth. These are the colors of Girls’ Day. 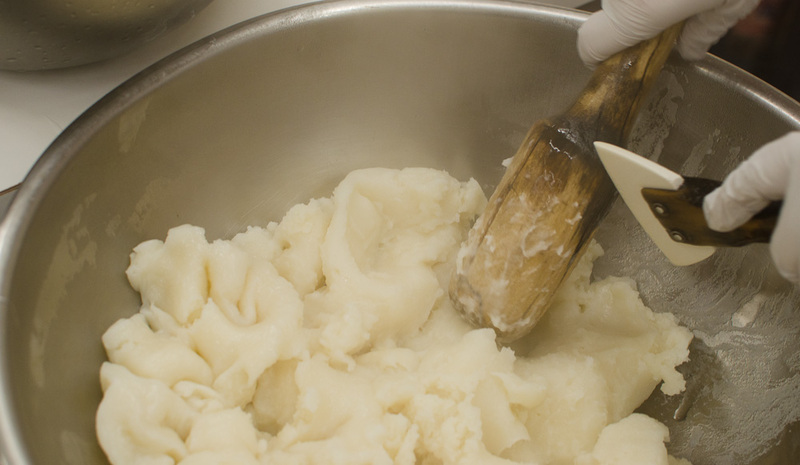 The Dango is steamed a total of three times. First the plain mochi dough is steamed. 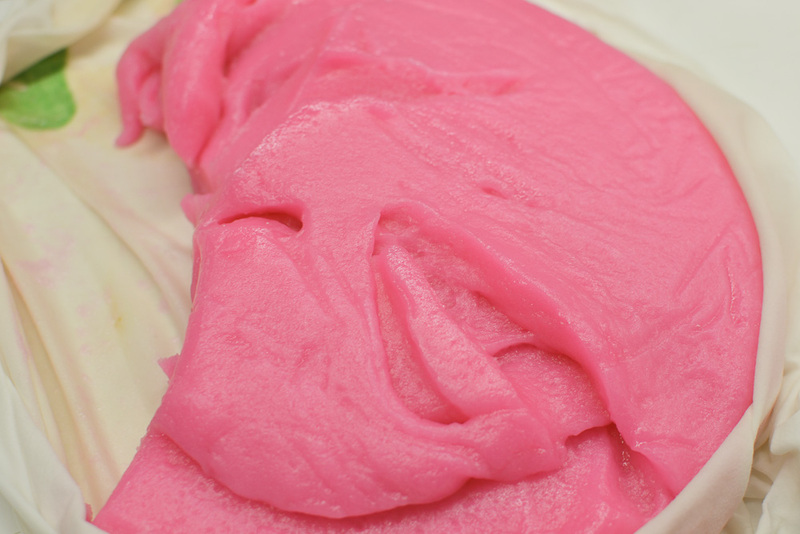 Next it is pounded with sugar, colored, then steamed again. All this while it is still super hot! Everything is done by hand. 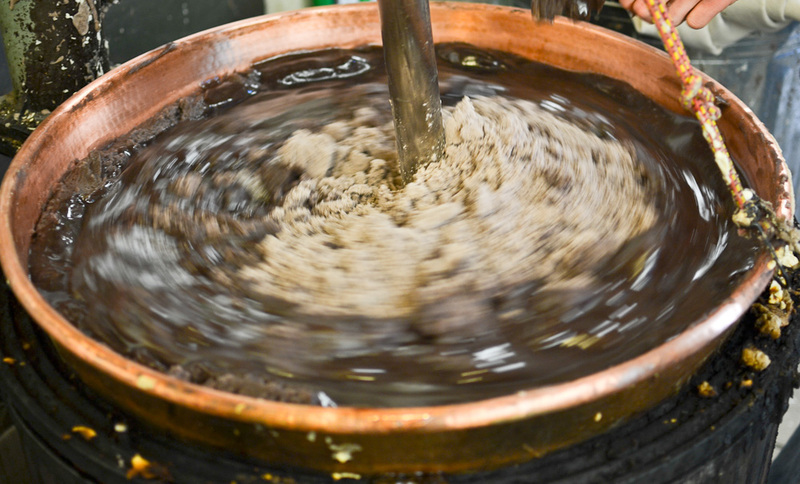 According to Linda there are machines that can do the mixing and pounding, but she does it all by hand because the resulting texture is much better. After the second steaming, each color is rolled into logs and put into this neat contraption. Press down and push forward! And out roll mochi balls! 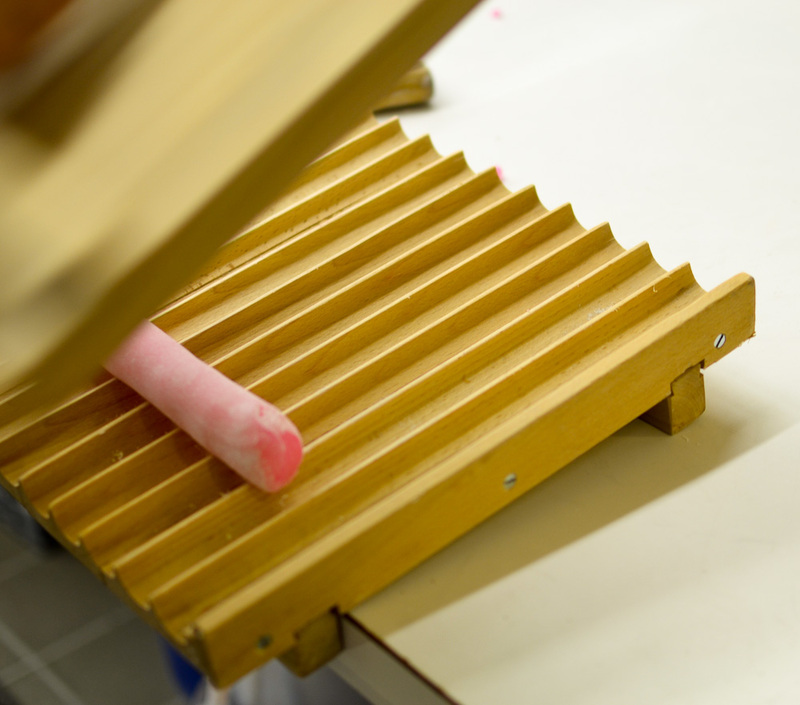 I was lucky and got to sample a runaway pink one– mmmm, it was still warm, and so soft. This is repeated for all three colors. 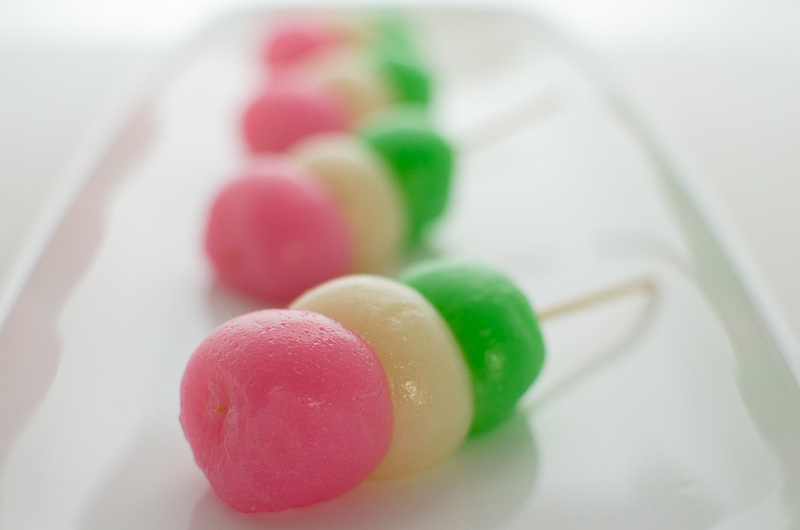 They are lined up– one pink, one white, one green– and skewered. Sent one last time to the steamer, they emerge with a glossy sheen. Girls’ Day Fun on a Stick! 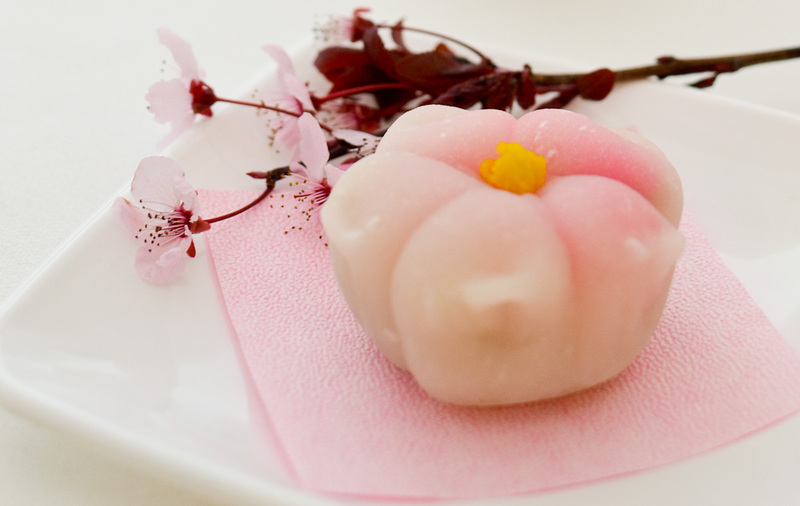 More pretty pink mochi –with white bean filling, sakura shaped yokan cut-outs on top, and brushed with kanten. Here are the emperor and empress hina dolls. They are typically displayed with their attendants and musicians on a red carpeted, tiered platform. More information can be found here. The dolls are believed to be able to absorb ill fortune. They are displayed from mid-February through March 3, after which they must be put away to avoid bad luck. We recently received this set of dolls from our friends Mika and Sara Watanabe from Matsuyama, Japan. We had the pleasure of having Sara stay with us for a short time as an exchange student two summers ago. Sara prepared some delicious somen and miso soup for us that she had practiced making with her mother, Mika. 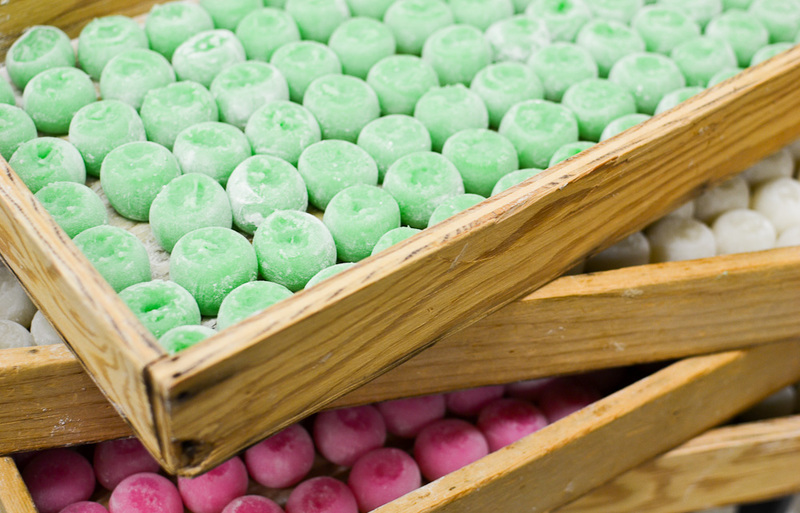 Japanese rice crackers (arare), sweet and savory, along with shirozake (rice wine) and rice cakes are traditionally served on this day. These “Hello Kitty” brand rice crackers and rice wine were also sent to us by Mika and Sara. In Japan, clouds are one of the symbolizations of sakura blossoms, as they bloom en masse. Soft, beautiful clouds– after watching all that mochi making, I felt more than ready to take a nap– on one of those sweet, sweet little pillows.